Whether performing at a coffeehouse, college concert or an outdoor festival, Jim’s music has never failed to capture the hearts and feet of his audience. His up tempo guitar style, mix of catchy originals and masterful interpretations of contemporary music leaves his audience feeling fully satisfied. Whether he’s finger picking a Celtic jig, a New Age instrumental, or singing a delta blues song, his distinctive style has won him both applause and accolades. 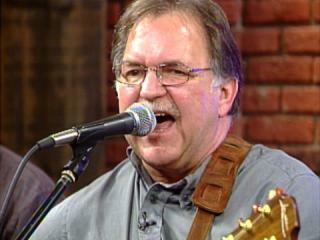 An accomplished songwriter, his original compositions have brought him awards and high honors throughout the country. He has shared the stage with nationally recognized artists as Doc Watson, Taj Mahal, Livingston Taylor, Jessie Colin Young, Dave Von Ronk, Mark Collie, The New Grass Revival, The Shaw Brothers and Bill Staines. His down to earth sense of humor permeates throughout his shows and along with his mastery of fingerstyle guitar and warm rich vocals, makes for an evening you won’t soon forget. Not only a performer, Jim has been teaching guitar at the Fiddlehead Center for the Arts in Gray Me to students of all ages and levels and has given workshops throughout New England. He’s the perfect musical answer for your corporate function, school event and college concert or workshop. Robert Silverstein of “20th Century Guitar” writes, “A gifted acoustic guitarist, Gallant’s fretboard work is both rhythmic and tuneful”. In the fall 2003 “ New England Trekker”, a New England sporting magazine did an indepth article of Jim and his music and called him a “world class player”. "The Odd Waltz, one of Gallant's originals shows how wonderful instrumental guitar can be.."
Jim made a television appearance on WCSH 6's 207 on Friday, March 18th, 2014 with Billy Belskis on bass and Mark Burns on vocals. View video.